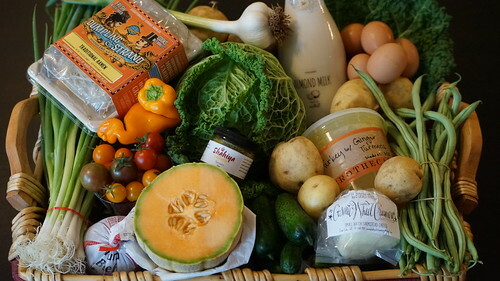 Shopping Basket from the July 30 Mill City Farmers Market - Mill City Farmers Market 2018 - Minneapolis Riverfront Neighborhoods. Savoy cabbage (from WEI) - nature's work of art. Those beautiful leaves will make perfect wraps for a brown rice and meat filling, and the rest will go into a slaw. New cheese from Cosmic Wheel Creamery - mozzarella. Shahiya Chitney has added smaller sized jars to their offering, and I'm trying the milder version this time.